Lochau Bodensee is located between Lindau and Bregenz. Although it is more of a transit village, Lochau is also the gateway to one of the most beautiful view points in the area. In Lochau you will find mountain guesthouses with a wide view over the lake and the Swiss Alps, traditional inns or gourmet restaurants with homemade delicacies. The ferry “Alte Fähre“, which has been converted into a restaurant in Lochau harbour, also offers the opportunity to stop for a bite to eat. 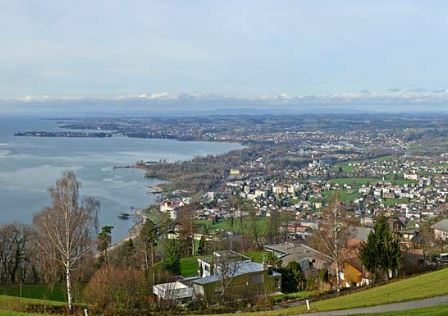 Lochau Bodensee has with the “Schwarzbad” an attractive as well as a family-friendly bathing beach at Bodensee Germany.